Forensic Science is broadly defined as the application of science to the purposes of law. It is highly interdisciplinary by nature and has become a vital part of the judicial and regulatory system worldwide. Professional forensic scientists, law enforcement personnel, and criminal justice employees all recognize the growing need for highly qualified specialists who can follow established protocols in the collection, preservation, analysis and presentation of forensic evidence. The Arcadia University Master of Science in Forensic Science (M.S.F.S.) program is nationally accredited by the Forensic Science Education Programs Accreditation Commission (FEPAC) of the American Academy of Forensic Sciences (AAFS). Arcadia University is one of only a select few institutions in the country to hold this accreditation which recognizes the high quality graduate forensic science curriculum offered through this program. The Master of Science in Forensic Science (M.S.F.S.) degree is offered by Arcadia University in partnership with the Center for Forensic Science Research & Education and in collaboration with NMS Labs, one of the nation’s premier ASCLD-LAB and ISO 17025 accredited forensic science laboratories. Both facilities are located about 5 miles from Arcadia University in Willow Grove, PA. A significant portion of the coursework is conducted at the Center for Forensic Science Research & Education facilities, and forensic practitioners from NMS Labs provide support for the instruction. Hands-on opportunities are an essential part of the educational experience in a Forensic Science program. Arcadia’s guaranteed internship at the Center for Forensic Science Research & Education is a unique benefit of Arcadia’s program. This highly desirable, comprehensive, and intensive 12-week internal internship program gives every student valuable real-world experience and career preparation in the following areas: Forensic Biology, Forensic Toxicology and Forensic Chemistry. The mission of the Forensic Science program at Arcadia University is to provide high quality, competent, and professional master’s level forensic science education and training. This mission is to be accomplished through contact with internal and external professional practitioners and academicians; through research, internships, and other forensic science activities intended to increase the students’ knowledge of forensic science, and through competent and ethical professional training. To provide a comprehensive graduate program in the areas of forensic biology, chemistry, toxicology and trace evidence analysis and to serve as a model for forensic science education excellence. To promote scholarly inquiry into the knowledge and techniques fundamental to the practice of forensic science. To provide outstanding resources for students in their professional forensic science development. To produce competent and skilled forensic science professionals who can serve as outstanding practitioners and leaders in the forensic science field. Our curriculum is unique in that it covers a variety of specialties, unlike other graduate programs that require a commitment to a single field of study, making for more wellrounded forensic practitioners. The curriculum involves classroom and laboratory exposure to the field of criminalistics including forensic biology, chemistry and trace analysis as well as forensic toxicology. Coursework emphasizing the development of problemsolving abilities is designed to encourage a concentration in these forensic science specialty areas and expose students to both relevant laboratory techniques and relevant medico-legal developments. An emphasis on laboratory coursework provides students with significant hands-on experiences. Students are afforded the opportunity to reinforce their laboratory skills via internship arrangements with practicing forensic laboratories, including NMS Labs in Willow Grove, PA and the Philadelphia Medical Examiner’s Office. An internship practicum at The Center for Forensic Science Research and Education is guaranteed for all students. These experiences, coupled with the completion of an independent research project, ensure that Arcadia graduates are well prepared for careers in forensic science and that they are well received by the forensic science community. The M.S.F.S. program focuses primarily on the fields of forensic biology, chemistry, toxicology, and trace evidence analysis. Forensic Biology involves the analysis of biological fluids and tissues collected at crime scenes and from articles of physical evidence for the purpose of identification and individualization. A forensic biologist employs a wide range of laboratory methods and instruments for body fluid identification and forensic DNA analysis. Forensic Chemistry involves the forensic application of chemical theories, techniques, and instrumentation to the analysis of illicit drugs, arson, explosives, and other trace evidence materials. Forensic Toxicology involves the detection and characterization of chemical substances exhibiting adverse or toxic physiological effects. A forensic toxicologist uses a wide range of laboratory methods, which may include spectrophotometric and chromatographic analyses. Trace Analysis involves the proper collection, preservation identification and comparison of items such as glass, paint, hairs, fibers and soil. A forensic trace evidence examiner will use instrumental, mechanical, chemical and visual techniques to analyze these types of trace evidence. A Forensic Science application, including personal statements, must be completed online at www.arcadia.edu/gradapp. A bachelor’s degree from an accredited institution with a GPA of 3.0 or better, with at least a 3.25 in the major. It is expected that students have an undergraduate degree in the natural or physical sciences. Completion of at least two semesters of general chemistry with laboratories, two semesters of organic chemistry with laboratories, and two semesters of general biology with laboratories. Three current letters of recommendation from persons familiar with the applicant’s ability to study graduate-level science. Students attending Arcadia University for their undergraduate studies only require two letters of recommendation. Test scores for the Graduate Record Examination (GRE) or the Medical College Admission Test (MCAT), taken within the last five years. International applicants should visit www.arcadia.edu/international for detailed information on admission requirements and application procedures. TOEFL/IELTS results are required for all students for whom English is a second language or who have not earned degrees or diplomas from post-secondary institutions in English-speaking countries (e.g. the United States, Canada, the United Kingdom, Republic of Ireland, Australia, and New Zealand). A courseby-course evaluation of all transcripts by an independent evaluation service based in the United States also is required. It is highly recommended that prospective undergraduate students have completed coursework in genetics, molecular biology, biochemistry, statistics, and instrumental/analytical chemistry. Arcadia Undergraduate students desiring assured admission must submit their completed applications by November 1 of the academic year of graduation from Arcadia University. Upon enrollment into their programs, all students must provide proof of medical insurance and also provide information about their health and medical history. If needed, medical insurance can be purchased through the University. More information. Completed applications will be reviewed on a rolling basis and should be submitted by January 15th. Those received after January 15th will be reviewed based on availability of space in the attending class. A student admitted to the full-time program and who wants to defer his or her admission for one year must submit a request to do so in writing to the Director. Deferrals will be granted by the Department on an individual basis. Once the deferral is granted, the student must submit the required deposit to reserve his or her seat in the class. This deposit will be credited toward tuition. Students who are granted a deferral must understand that they will be subject to the prevailing tuition at the time of matriculation to the program. Students working full-time may enroll in and complete the M.S.F.S. program on a part-time basis. Although designated as a parttime program, the coursework will continue to be offered at existing times. Students will generally take one to two courses per semester and adjust their work schedule to attend and complete course requirements. Matriculated student requirements are similar to the admission requirements for the full-time program. Students will apply to the program using the same procedure as students applying to the full-time program. Admission to the part-time program may occur in either Fall or Spring semesters. Applicants to the matriculated part-time program with two or more years of relevant laboratory experience at a forensic laboratory may have the GRE requirement waived. Students interested in the program should be aware of the National Institute of Justice Report entitled “Qualifications for a Career in Forensic Science.” This document details the personal, professional and academic criteria which will influence a prospective forensic science examiner’s suitability for employment. With regard to personal characteristics, the document states that “Because forensic science is part of the criminal justice system, personal honesty, integrity, and scientific objectivity are paramount. Those seeking careers in this field should be aware that background checks similar to those required for law enforcement officers are likely to be a condition of employment. The following may be conducted and/or reviewed before an employment offer is made and may remain as ongoing conditions of employment (this list is not all inclusive): drug tests, history of drug use, criminal history, personal associations, polygraph examination, driving record, past work performance, credit history, and medical or physical examination. Personal candor in these areas is critical. Registration, travel and hotel accommodations for 1 national and 1 regional forensic science meeting. Registration fee for sitting the FSAT once per year. Several partial-tuition scholarships are available for students in the Forensic Science program. Upon acceptance into the program, students will be reviewed automatically for these scholarships, which are based upon academic achievement and are renewable for two years. Visit www.arcadia.edu/finaid for more information on other available financial aid. Graduate assistantships are available on a semester-to-semester basis. Select students automatically are awarded graduate assistantships upon acceptance, but any graduate student may apply for a campus-wide graduate assistantship. Questions regarding graduate assistantships should be directed to the Office of Graduate and Undergraduate Studies at 215-572-2925. All financial aid paperwork not submitted online should be sent to the Office of Enrollment Management/Financial Aid. Please email finaid@arcadia.edu or call 1-877-ARCADIA (1-877-272-2342) if you have additional questions about financial aid. The Master of Science in Forensic Science (M.S.F.S.) is offered by Arcadia University in partnership with the Center for Forensic Science Research and Education (CFSRE) and in collaboration with NMS Labs, one of the nation’s premier forensic science laboratories. Both facilities are about 10 minutes from Arcadia University in Willow Grove, Pa. A significant portion of the coursework is conducted at the CFSRE facility, and forensic practitioners from NMS Labs provide a substantial part of the instruction. Among forensic college programs, Arcadia is unique in its partnership with the FRFRF and association with NMS Labs, which is frequently involved in high-profile cases as well as serving the local law enforcement community. This professional alliance provides a source of adjunct instructors, a forensic library, invaluable links to the forensic science community, state-of-the-art laboratory equipment and facilities. Arcadia believes that hands-on forensic science experience is essential. Arcadia's 12-credit guaranteed internship at the Center for Forensic Science Research and Education is a unique feature not available at other colleges with forensic science. This highly desirable, comprehensive, and intensive 14-week internal internship program gives every student valuable real-world experience and career preparation in three areas: Forensic Biology, Forensic Toxicology, and Forensic Chemistry. Arcadia Forensic Science students take classes with renown forensic scientists on site at the Center for Forensic Science Research and Education, where fully-equipped labs and smart classrooms provide a personal, hands-on learning experience. Interaction in forensic science laboratories with established researchers and practitioners, often involving case material, is a unique feature of Arcadia's Forensic Science program. Students also have opportunities to conduct original forensic research. The Crime Scene House (CSH) at Arcadia University is a multi-use facility managed by the Forensic Science Program. The facility provides a hands-on, realistic training environment to both undergraduate and graduate students studying criminal justice and forensic science. 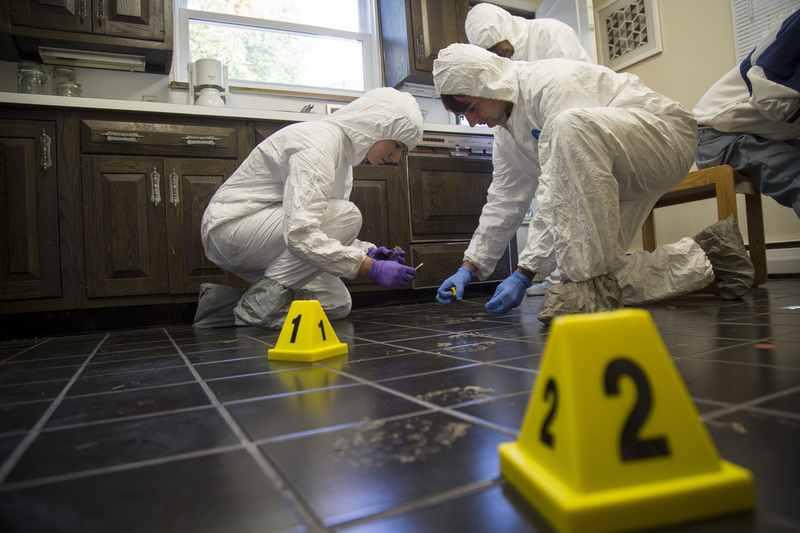 Students in the Forensic Science program principally use the space for their Crime Scene Investigation class and their Pattern Analysis class. The CSH is open for use by any department or student group at Arcadia and has also been utilized by local law enforcement agencies for training as well as school and community groups for enrichment activities. The CSH is located at 2063 Church Road and consists of living room, dining room, kitchen, bathroom, and outdoor crime scene spaces. Also available is a dry lab area available for processing evidence. The house comfortably handles groups of up to 25. Organizations interested in using the Crime Scene House should contact Professor Shane Tobe at tobes@arcadia.edu. Forensic Science students practice evidence-gathering techniques at Arcadia's Crime Scene House. What is the employment rate of graduates from the program? Including graduates from 2005 through 2011, the total employment rate for all responding alumni is 90 percent. What if my bachelor's degree is in Biology? Or in Chemistry? A master's forensic scientist degree will combine expertise in both biology and chemistry, but you can enter the program with either area of speciality. If you studied biology as an undergraduate, your first year of Forensic Science coursework will include courses in Chemistry. If you studied chemistry as an undergraduate, your first year in the master's degree program in Forensic Science includes coursework in Biology. What makes Arcadia renowned among colleges offering forensic science degrees? Among forensic science colleges, Arcadia is unique in its partnership with the nationally known NMS Labs, which is among the nation's premier labs and is frequently involved in high-profile cases as well as serving the local law enforcement community. Arcadia is also among an elite number of forensics colleges with full national recognition and accreditation. What should I look for in a forensic science school? When potential employers are comparing candidates with degrees in forensic science, they look first for a forensic graduate program and then to see if the master's degree program is fully accredited by FEPAC (Forensic Science Education Programs Accreditation Commission). Should I get a bachelor's or a master's degree in Forensic Science? While there are several forensic science schools and colleges that offer forensic science at the undergraduate level, many of those programs focus on technician skills or criminology—not on the science knowledge needed to become a practicing Forensic Scientist. Students who want to use DNA samples to help identify victims, help police determine if poison was a murder weapon, and conduct chemical testing on bomb residue need to attend a forensic science university with a master's program that offers a strong science foundation. Arcadia's forensic science studies in these areas are taught by some of the nation's top forensic scientists, who teach in addition to continuing to work daily to help solve crime and forensic mysteries and research new forensic science techniques and materials. This level of expertise is not usually available at college offering forensic science as an undergraduate program. Does it make a difference where I get my bachelor's degree? Students who complete Arcadia's pre-Forensic Science 4+2 program are assured admission to the master's in Forensic Science program. Arcadia's undergraduate students study either Chemistry or Biology, and many participate in the Honors Program. Knowing that if you successfully complete the forensic science course requirements a spot in the master's program is waiting for you takes some of the uncertainty out of planning your future and choosing among forensic science degree programs. What type of Forensic Science classes will I take? Arcadia's master's degree in Forensic Science gives graduates a strong Forensic Science education in areas such as Molecular Biology, Toxicology, Genetics and DNA, and Forensic Medicine, to name just a few of the Forensic Science courses essential at the graduate level. Does Arcadia offer anything that other colleges for forensic science don't? Arcadia's guaranteed internship at the Center for Forensic Science Research and Education is a unique feature not available at other colleges with forensic science. This highly desirable 14-week internal internship program at the Foundation gives every student valuable real-world experience and career-preparation. Arcadia believes that hands-on experience is so essential that it is a forensic science degree requirement. If I want to study forensic science, what types of careers can I expect? Earning a master's in forensic science from Arcadia positions you for employment at some of the nation's top law enforcement agencies, medical examiner's offices, and crime labs. Dr. Michael Rieders, an Arcadia alum, is the CEO of NMS Labs and teaches in the college's forensic science program, but he finds time for some high-profile cases, such as isolating Salvador Dali's DNA or donning his scuba gear to collect forensic evidence. Alumni with Forensic Science degrees can be found at the New York Medical Examiner's office. Will I have big classes or be in small groups? Every Forensic Science class at Arcadia is a lesson in personal attention. Most classes are held onsite at the nearby Center for Forensic Science Research and Education, where students and faculty form a closeknit forensic science college community. A low student-faculty ratio means students work closely with faculty in each Forensic Science course.